Here are a couple of photos of one of the most docile and cooperative subjects I’ve ever had to deal with! They were taken about a week ago (May 6th) and I’ve only just got round to identifying it as Eutrapela clemataria (6966), Curved-toothed Geometer. We found it on the inside edge of one of the double doors that gives access to the space beneath the deck attached to our house, obviously a very neat crevice as a hideaway for the daytime – until I rather compromised that by opening them! 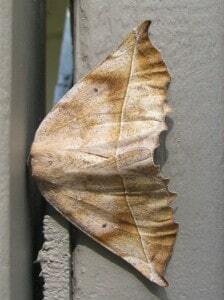 From what I have picked up on the web I think it is a common moth but a new one to us, and we were most taken with its wonderful camouflage as a sort of scorched autumnal leaf – presumably it tucks itself away on trees normally. I’m attaching two photos, one with the scale (10cm/4ins), and one without which enlarges very well for enjoying the pristine condition and wonderful detail. 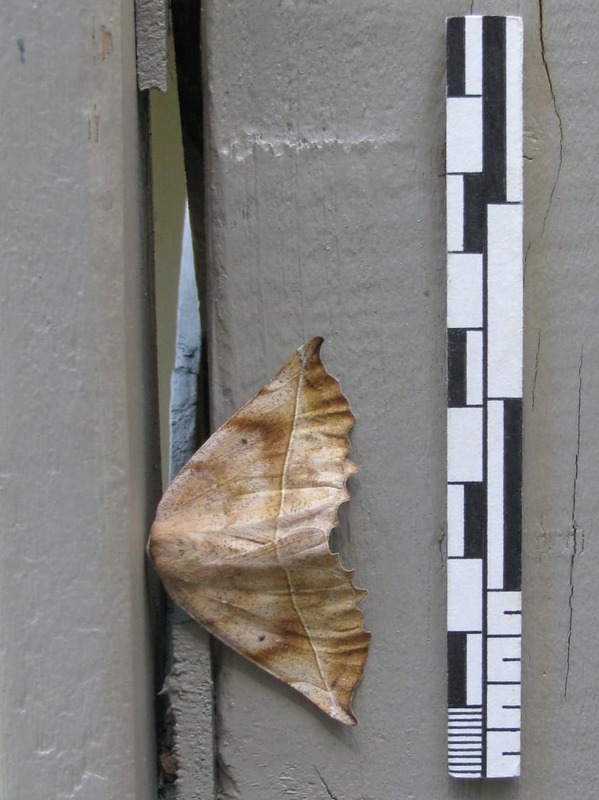 PS During my internet search for identification today I was rather amused to come across a posted photo on one site that captioned it Eutrapela crematoria! 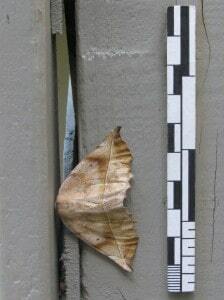 I thought that went rather well with my very first impression of the moth resembling a scorched leaf!